and their pets. One day, Mama Sara stumbles upon an injured crow. it doesn’t want to leave. It’s not the family who adopts a pet but the other way around. it gives Al the ability to speak. Yes, Al is a talking crow. clean laundry onto the ground. Al is very smart. He is aware of his bad actions, which makes it even more fun. But then a storm is coming and Al isn’t home. The family is worried. Will he make it? You should read the story to find out! 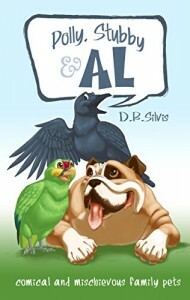 This is a sweet and funny little book about a nice family and interesting pets. Animal-loving kids would enjoy reading about Al’s pranks.